Autodesk University is done for 2008 now. I have to say that I always learn something new, and I'm always glad I went (even though it can get pretty exhausting). I ran into a lot of old friends and colleagues, as well as making a few more, and saw a couple of tricks too. I'm afraid I still have to sort out some notes and get all my tricks put together. But I'm hoping to start posting some by the end of the week (really!). One of the things I did start to get to play with is a product called Showcase. 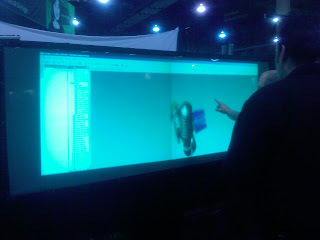 Picture being able to bring in an Inventor model, and render it in real time. Picture photo-realistic renderings that you can rotate, view, and update almost instantly (not the render in place, change rerender type). I attached a screen capture for interest, and I'll kick up some tips at the end of the week! There's a webcast on Showcase coming up that Kyle (our industrial design AE) is hosting. Feel free to check them out at the links below! Message: Accelerate your design review process with high end, easy-to-use rendering. 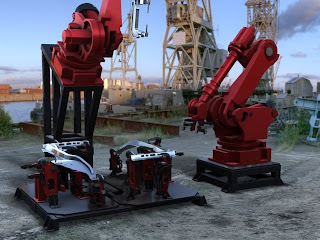 Message: Showcase works with Solidworks. 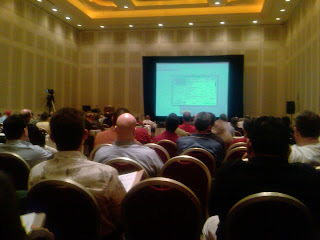 Plus a couple of pictures from AU (sorry for the bad quality, I had to use my cell phone). Rotating models by touching the screen directly. It's like a giant I-phone! Sitting in one of the classes. I think this is JD Mather's importing neutral formats course!